It's fair to say that my life has changed a lot over the past couple of years; from a state of constant anxiety and stress, to a much more grounded lifestyle filled with purpose. 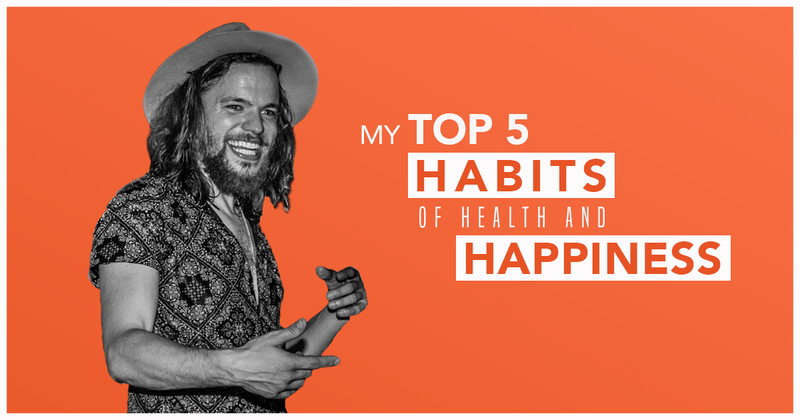 With today marking the International Day of Happiness, I want to give you a look into some of the strategies I have implemented to improve my health and well being for the long term. It wasn’t until only recently that I was very much of the belief that meditation was purely for Buddhists, Hindus and Hippies; and that anyone who practised it was on another spectrum of the universe that I would never venture towards. The idea of sitting in silence, alone with my thoughts horrified me quite frankly. But after discovering the benefits of mindfulness in mid 2016, and learning how go for a walk in the morning, be fully present with my surroundings, and undistracted by my thoughts (a phenomenon I was previously unaware of), I eventually found myself wanting to dig deeper into the world of meditation. Last year I began practicing breath awareness meditation, and was pleased to learn that I didn’t need to dress up like a monk in order to do so. Fitted in my black denim jeans and t-shirt I started small with short 2-5 minute meditations and have now worked up to 10-20 minute transcendental meditations (using a mantra repeated in your head as your centre point) at least twice a day. If you often feel edgy, stressed, anxious or rushed, I can’t recommend meditation highly enough as a means to a calmer, happier life. We humans often speak of wanting more freedom in our lives, but not many of us would concur that routine and structure is what will actually create it. I’ve always been a sucker for a routine heavy lifestyle, but this year I’ve taken things to a whole new level. After reading Gary Keller’s ‘The One Thing’ late last year, I’ve put in the effort to introduce ‘time blocking’ into my day to day life, a period of the day by which I am unavailable to the world and focused solely on what it is I truly love to do; writing, playing and rehearsing my music! Time is the most valuable asset we have. Once it’s gone, its gone. Period. So I want to make the most of mine whilst I’m alive and have learnt that if I’m going to achieve the things I’d like to achieve, such as a life long global career as a singer, songwriter and producer, it’s going to require a commitment to strict routine in order to stay fit, happy and focused. 2:30pm – Creative work such as writing this blog, brainstorming ideas ect. If you often find yourself saying “I’ve got no time”, I would strongly encourage you to start recognizing that we all have the same 24 hours in the day; some people just utilize their time better than others. With a little bit of planning, there’s no reason why you can’t be one of those people. It might bring you more happiness! I began implementing cold showers into my day-to-day life earlier this year after the hot water system at our house broke down; leaving us with only icy water running from our taps for a number of days. Fortunately for me, the malfunction turned out to be a blessing in disguise, and encouraged me to make a start on something I’d become intrigued about following various conversations with friends, and watching videos of Win Hoff (The Iceman) on Youtube. Taking a cold shower comes with many health benefits including an increased mental alertness, stronger resilience to stress, better immunity and circulation of the blood, weight loss, muscle recovery, and less susceptibility to depression; all of which help me to live… yep, you guessed it, happier! Like any new habit, at first, taking cold showers was a real challenge and felt pretty uncomfortable; but our minds and bodies are amazingly flexible and before I could say “Bob’s your uncle” mine had adapted to my new morning ritual. It’s been approximately two and a half months since I’ve touched a hot tap in the shower and I feel like cold showers have built a new willpower within me that I’ve never experienced. If you want to discover one of the greatest life hacks going around, I highly recommend becoming a member of the cold shower revolution! Exercise has always been a big part of my life. Back when I was in school I was participating in sports on a daily basis. Football, cricket, basketball, athletics, karate, soccer; you name it, if it meant physical exercise, I was there with bells on. When I hit adolescence I began skateboarding daily; and by the time I was old enough to drive a car I was a regular at my local gym. But never before has my exercise routine been carried out with a particular goal in mind. I had always approached exercise with an “I just want to stay fit and healthy” attitude; and whilst this approach was great, it meant that my commitment would come and go like the wind. This year I’ve begun working towards a goal of completing a half marathon, which has given me structure to my exercise like never before, and is helping me stay more committed than ever. Since beginning my training back in late December, my energy levels have increased dramatically; I’m sleeping better, and of course, smiling a whole lot more too! If you’re the kind of person who’s wants to stay fit, but finds it hard to stay enthusiastic, try setting a goal and get excited about what you could achieve (as apposed to how much work it’s going to take). Tell all your friends and then start taking little steps towards the goal. As herd mammals, we don’t like to let others down, so telling as many people as possible will help you to commit. As the very proud son of a mother who practices as a psychologist, and someone who’s life has been literally transformed by one; I cannot put enough emphasis on the importance of this habit for anyone who might be feeling mentally ‘unfit’. Unfortunately, there still seems to be some people in society who are stuck in the 1900’s and think that booking an appointment with a psychologist is something to be ashamed of; like it’s some kind of sin; and that by doing so must mean you’re crazy. This old mentality couldn’t be any further from the truth and I am now making it my personal mission to do my part to change this notion. For me, I see my psychologist as no different to a personal trainer who can help me to stay physically fit, or a dietician who can keep me nutritionally fit. My psychologist helps me stay in shape mentally; and as a writer who has to dig up old memories and experiences day after day in order to produce new work with authenticity and credibility, I need that workout like the desert needs the rain. I’ve been attending sessions with my psychologist since early 2017 now (when I was deep in my depression) and have seen my mental fitness gradually improve ever since. Every 2-6 weeks I amp myself up in the car on the way to my appointment like Usain Bolt before an Olympic 100 metre sprint; I lay all my cards on the table and I cry, and cry, and cry, a lot, with no shame; because I know that with every tear I shed I reap the rewards, and in putting myself through short term pain I move towards long term happiness.